TANGERINE DREAM - FORCE MAJEURE, written and compiled by EDGAR FROESE (in English)"
ALREADY RELEASED ON: 29th SEPTEMBER 2017!! 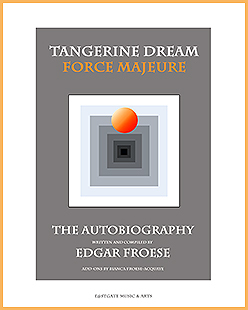 At last it's here: The first and only AUTOBIOGRAPHY of TANGERINE DREAM - personally written by Edgar Froese! With over 400 pages, it's an authentic, sincere and frank account of the unusual adventures of a band and their leader and founder Edgar Froese, a group whose electronic innovations wrote themselves in to the history books during the musically crystallised years of the 1970s. Edgar's narrative style in this book, titled "FORCE MAJEURE", is as direct and uncompromising as the man himself, and it reflects the 'storm and stress' phase of the Sixties and Seventies which he experienced first-hand. At the same time his stories are amusing and written in his own distinct metaphorical language – the language which one can find again and again in his musical compositions. The book is exciting from beginning to end, even for those who do not know Edgar Froese or Tangerine Dream, and the reader will discover stories unknown until now, getting to the root of rumours surrounding the band and their productions which fans have speculated about for decades. Edgar's appreciation of the people who stood at his side during those heady days is also covered in this book, whether they were creatives or those who generously offered him advice at the various stages of the band's career. The story flows directly from source – a rare story of a pioneer who yearned and suffered whilst producing a progressive collage of sounds only to unexpectedly write history with it years later. This book isn't just a simple chronological list of anecdotes about the career of a band. This autobiography offers the reader a deep insight into the life and times of the band, and Edgar Froese leads you on a very personal journey through his own thoughts and actions, his everyday life and his sources of inspiration, his cooperative efforts, his work and the conflicts which accompanied him through countless concerts across the globe. The adventure recounts crazy meetings and exciting episodes in the course of his career, moments spent with many interesting and well-known personalities like Salvador Dalí, David Bowie, Richard Branson, Andy Warhol, John Peel, Andy Summers, Jimi Hendrix, Oliver Stone, Jim Rakete, Stevie Nicks, Ridley Scott, Michael Mann, Brigitte Bardot etc. - to name but a few. Over 45 years of experience on stage and more than 16 years in the soundtrack business in Hollywood offer up so much content and destiny in the narrative that this luxuriance of experience would have been sufficient for at least two lives. Edgar wrote his autobiography over a period spanning approximately seven years, and he invested every free moment he had into it when he was not working on film soundtracks, album productions and live concerts. Initially the autobiography will be published in English and German, and we hope to find a publishing company that will offer the book in other languages (e.g., French and Spanish) at a later date. The first edition will be published by EASTGATE because this will ensure that the contents of the book will not be able to be subsequently changed by other publishing companies. FORCE MAJEURE is a large-sized hardcover book (1.5 kg of weight), has about 400 pages with many so far unreleased photos etc. etc. ATTENTION: PLEASE ORDER THIS BOOK SEPARATELY FROM OTHER PRODUCTS DUE TO POSTAGE CONSIDERATIONS! THANK YOU FOR YOUR UNDERSTANDING.